On Saturday I stepped out of my shell a little bit and met up with a handful of other Minnesota Bloggers to give of my time at Second Harvest Heartland, an organization that helps food banks here in Minnesota. We were a small but mighty group and it was nice to meet a few ladies I hadn't met before. Sarah of Love Full Bloom was nice enough to register and set us up for a morning of giving - and I stole a few pictures of our day from her to share here so you can see what we did! 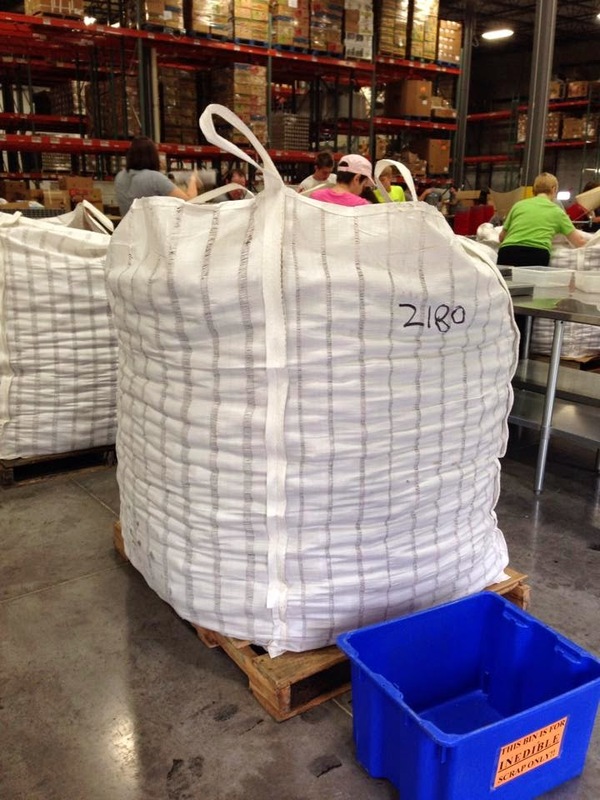 Second Harvest received some giant bags of potatoes from farmers in East Grand Forks. When I say giant potato bags, I mean giant. Take a look below. Obviously, this giant bag is not suitable for distribution! So, they needed us to help out by sorting through the large bag and pulling out any rotten or spoiled potatoes and then taking the good ones and measuring them into five pound bags. 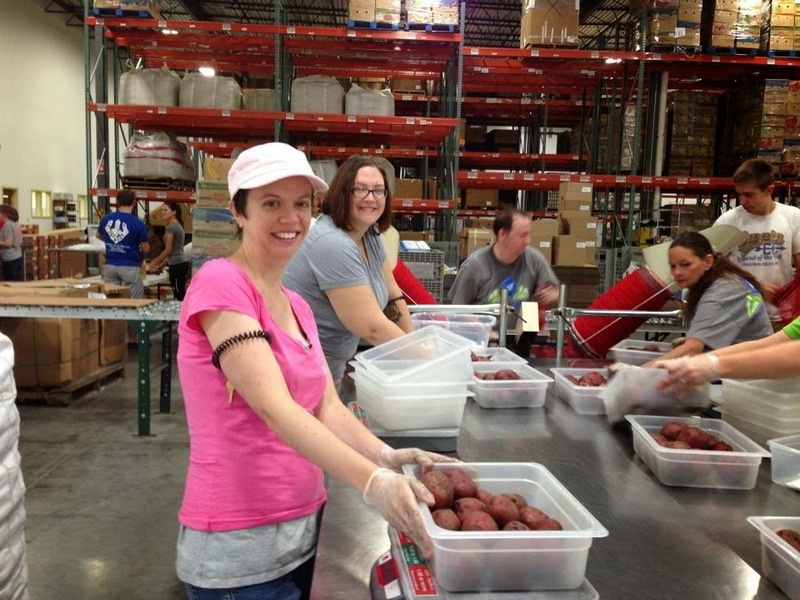 Here I am measuring out potatoes with Jenn from Wonderfully Unkmept. It was quite an operation. There were several other groups volunteering that day as well. Some of them were also taking giant boxes of cereal donated from Kelloggs and breaking those down into smaller boxes as well. At the end of our shift between the cereal and the potatoes we packaged up 13457 lbs of food that will help families in Minnesota and Western Wisconsin! That's pretty awesome when we learned 1 in 10 families in those areas are struggling to put food on their table each night. Makes the two and a half hours we worked seem like nothing. I'd gladly do it again! These ladies were a pleasure to work with and it was awesome having a chance to meet some other bloggers from Minnesota. I had to laugh at how the other groups we were working with kept asking "so what do you blog about?" and we're all like, um, stuff? At any rate it was a very worthwhile morning and I look forward to going back! How wonderful! You met nice people and did good work at the same time. I admire that. You're special, Beth! That's awesome! I've gone with my team to Feed My Starving Children before and had the same feeling when we were finished. Dude this is so awesome! My brother walked into the Forgotten Harvest by us to see what it was all about and he said that everyone was super friendly! I should get Kyle and I to volunteer, we always say that we are and then never do. I'm so bummed I couldn't make it but my husband and I already had plans that day. But if the group ever does it again, I'll definitely try to make it! What an awesome blogger event. I love that you guys got together to give back to the community. This is seriously a great idea--I may pitch it to my local blogging group! what an awesome idea to participate in! while i donate money sometimes, it's nice to actually see charity in action, like this. It was so great to meet you! I hope to see you at other events now!! I'm glad you had such a wonderful experience! 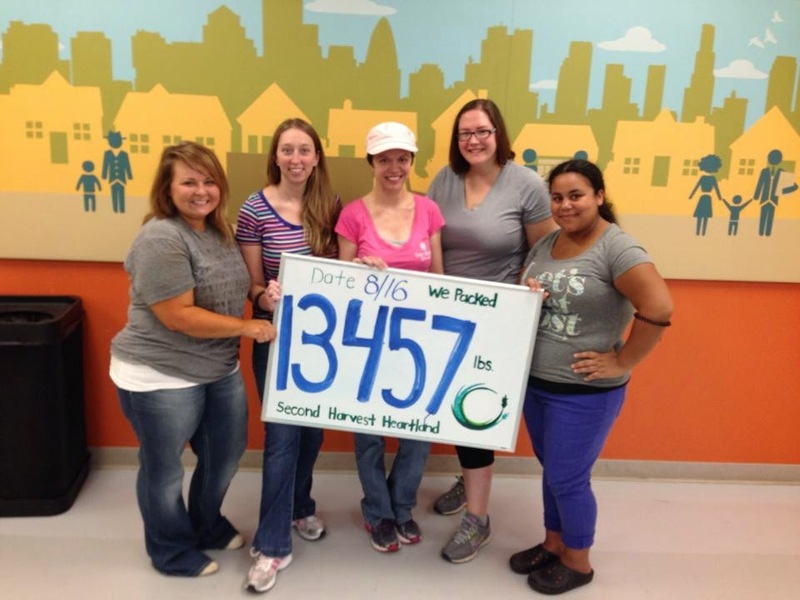 Volunteering can be so rewarding, knowing you are making the community just a little brighter.